Heavy Hauler Outdoor Gear Lanyard Model F -- Orange/Black. $14.99. "It's very useful to have them both together and it's useful that they're at different heights so they don't bang into each other." Mix of everything - 65lbs. Family pet. I keep the dog whistle on the smaller clip and the remote for the E-collar on the larger one. It's very useful to have them both together and it's useful that they're at different heights so they don't bang into each other. Awesome product. Perfect for whistle and e-collar remote. Good construction. I am holding a whistle and a shock collar controller, and it works great. No issues after a month of use. Great training lanyard. Perfect for e-collar remote and whistle. Highly recommend. Very nice lanyard. Real handy when I'm in the field working my dogs. 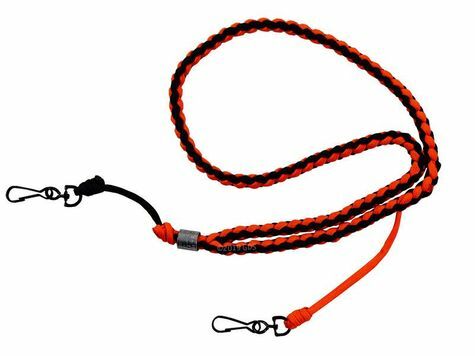 I would recommend this lanyard to anyone who trains or hunts with their dogs. Great shipping, very fast. Quality products. High quality. Very well built. The ability to get to your transmitter or whistle quickly is a must with any serious trainer or hunter. This lanyard allows that with a single bottom swivel clip for your transmitter and a side dropper for a whistle. A great addition to any field bag.